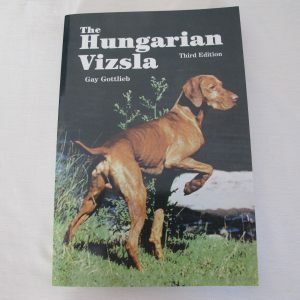 A full and impressive history of the breed can be found in Gay Gottlieb’s definitive work, ‘The Hungarian Vizsla’ (ISBN 0-947647-09-0) from where the following information was obtained. Some research suggests the origins of this breed lie in the ninth century, some suggests the eleventh, whilst other points to a later time. In her seminal book on the Hungarian Vizsla, Gay Gottlieb includes a museum picture of a Gothic panel from the fifteenth century: it shows a dog that is believed to be a Vizsla. The one thing we can rely upon, about which there can be little doubt, is that the Vizsla has a very long history. She explains how the breed has changed its appearance somewhat over the centuries, to the lovely animal we now delight in. In its early days, the breed was bred with the The Yellow Turkish dogs and latterly many other breeds are thought to have been in its bloodlines. Gay Gottlieb refers to Setters, Bloodhounds, the German Vortsthund, the Balkan Beagle, the ancient Foxhound, the Pammion Hound and the Romanian Copie, as well as the Greyhound and the Sloughi. Little wonder, then, that it carries such a variety of instincts and characteristics, all making it such a versatile breed and adaptable companion for many different types of owner. During the early part of the twentieth century, the Hungarian Empire experienced many difficulties from hostile countries intent on stealing its land and taking over its rule. During this time, the Vizsla also experienced difficulties and lovers of the breed determined to save it from the possibility of extinction. They formed a club in 1924 that resulted in individual dogs being registered for the first time in its history. However, things got even worse for the Vizsla after the disintegration of the Hungarian Empire, particularly during the second World War and the Russian Occupation. Fortunately, some emigrés to Europe and further afield smuggled their Vizslas with them and the breed thus became established outside Hungary. Today, the Vizsla can be found all over the world with good specimens of the breed regularly exported and imported between breeders. It is believed two Vizslas were imported into the UK before the second World War in 1939. However, the first registration of imported Vizslas was recorded by the Kennel Club in 1953. Thereafter, between 1953 and 1955, there were three matings from this pair – resulting in 13 puppies – with some being exported to America. Over the years, there were other imports and by the mid 1960s some 300 Vizslas were known to be in the UK. Despite the growth in its numbers, Vizslas were still classified as a rare breed and it was not until 1971 that the Hungarian Vizsla breed was awarded challenge certificate status for the first time. Since then, a glance at the Show Results will demonstrate how the breed has gone from strength to strength in the ring. It has also gained recognition in the Field and many other areas of activity. Regardless of the category in which they are used, all Vizslas should first and foremost be dearly loved family pets, as well as being respected participants in their chosen activity. There are two clubs/societies dedicated to the Hungarian Vizsla: The Hungarian Vizsla Club and The Hungarian Vizsla Society. Both have as their purpose the welfare of the breed and promote good practice for owners.